Hi sassy friends... Are you ready for our newest challenge? and that is JanetLynne.. Congratulations to you JanetLynne. Please email Sassy Cheryl to arrange for your gift certificate. Cathy continues as our hostess this week and she's put together a color combination for our challenge. 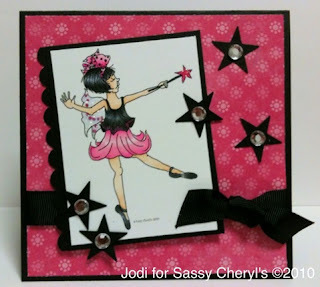 It's black, white and pink with embellishments.. Here's what the design team has put together as some inspiration. We would love for you to join us this week in our color combo challenge. Just create a project using a Sassy Cheryl image using these colors and link up your project here using Mr. Linky. We'll be by to say hello and see your beautiful creation. One lucky person will be chosen next week that will win a $5 gift certificate to Sassy Cheryl's shop. There are so many darling, whimsical images to pick from. How in the world do you all make these cards even better each week!? GORGEOUS!!!!!!!!!!!!!!!!!!!! What an amazing DT I have! Just send me a quick email and I'll get your GC right out to you! I love pink and black. This will be another fun challenge. Fabulous cards DT. Thanks for the inspiration. Congrats JanetLynn - again! The DT has done a wonderful job, lots of yummy looking cards and projects to see. Thank you Cathy for so much fun. One of my favorite color combinations. DT, your cards and creations are as usual spectacular. just found you Cheryl so thought it would be fun to enter your challenge. All the cards are by the DT girls are fabulous. Oh, they are truly beautiful!! Love them all so much I decided to join in this week.